Ørsted, one of the world’s largest renewable energy companies, will generate almost only green energy by 2025, and bring clean energy to more than 50 million people by 2030. Read more in their recently-published Sustainability Report. A world that runs entirely on green energy, begins at home, and Ørsted is close to fully decarbonizing its own heat and power generation. 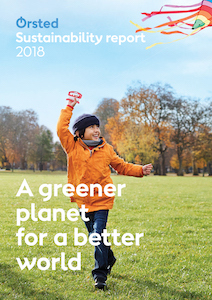 The company highlights this and other key sustainability outcomes in their 2018 sustainability report “A greener planet for a better world”. "Climate change is one of the defining challenges of our time. A world fully powered by green energy rather than fossil fuels is not only necessary to avoid irreversible change to our planet, it is also possible," says Henrik Poulsen, CEO of Ørsted. Ørsted is the global leader in offshore wind. The Denmark-headquartered company has a portfolio of offshore and onshore wind farms, bioenergy plants and solar and energy storage solutions – all of which will play an important role in helping to create a world that runs entirely on green energy. Although there is currently no trajectory for carbon emissions reduction determined for a 1.5°C scenario, it is clear Ørsted’s current carbon emissions target will continue to be well within the limits for the energy sector to stay below the 1.5°C scenario. 75% of the company’s energy generation is based on renewables – targeting 99% by 2025. 6.3mn tons of carbon emissions avoided annually by the company’s offshore wind farms – equal to taking more than three million cars off the streets for a year. With its partners, Ørsted has invested DKK 165bn in renewable energy over the past decade and plans to invest another DKK 200bn (approx. USD 30bn) in green energy towards 2025. To date, the company has installed offshore wind capacity to power more than 12 million people and aims to bring renewable power to more than 50 million people by 2030. In the US, a key market for Ørsted, the company is working to bring offshore wind energy to 800,000 people on the US East Coast by 2023. Ørsted’s offshore wind farms, including those that are installed or under construction, create 180,000 job-years throughout their lifetime, including skilled engineering jobs in construction and maintenance. Ørsted remains dedicated to protecting biodiversity and raising awareness of climate change among children and young people. The company launched a children’s book in end-January and held a Climate Safari event in 2018 together with the World Wide Fund for Nature (WWF), Denmark, to engage young people to take climate action. Ørsted and WWF, Denmark, will continue their partnership with new activities in 2019.